Starring: Dennis Quaid, Lou Gossett, Jr. 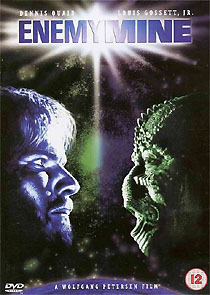 Many UK fans will never have had an opportunity to see the full length, 104m version of Enemy Mine, Wolfgang Petersen’s 1985 SF update of Hell in the Pacific, which was released here briefly, and only on laserdisc. (The VHS version was the abbreviated 89m theatrical version). The UK Region 2 DVD presents the film in a smart new 2.35:1, 16:9-enhanced transfer, with 4.0 sound (left, centre, right and mono surround, at 384kbps). Extras are meagre: the trailer (set to Philip Glass's music from Mishima) is present, as is a bonus not on the American disc: a three-minute extended scene presented in German, with optional English subtitles. The “Behind The Scenes” option leads to a gallery of three - yes, three! - photo’s. Better than nothing, but surely there must have been dozens - if not hundreds - taken on set.